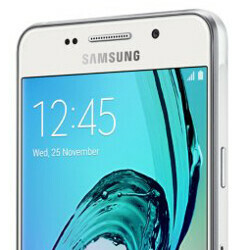 If you had any doubts that Samsung Galaxy A3 (2017) is going to be announced this year, you need to put those to rest since the smartphone has just been spotted at Zauba, the website that tracks import and export products in India. A sample Samsung smartphone with model number SM-A320F has been listed at Zauba, coming directly from South Korea. The same device with a similar model number (SM-A320x) has been recently spotted at GFXBench, which is why we know they're the same Galaxy A3 (2017) smartphone. The only other piece of information that we got from the Zauba's listing is the fact that the phone features a 4.7-inch display, which confirms the previous report about the Galaxy A3 (2017) benchmark results. The value of the smartphone is set to around $155, but that doesn't mean this is the retail price of the Galaxy A3 (2017). We expect the price of the phone to be announced when it's officially unveiled. No additional details are offered by Zauba regarding the Galaxy A3 (2017), but if you're unaware about the phone's specs here is a quick rundown of what we know so far. The 4.7-inch display supports HD (720p) resolution. The smartphone is powered by an octa-core Exynos 7870 processor clocked at 1.5GHz, as well as a Mali-T830 GPU and 2GB of RAM. There are only 8GB of storage inside, but Samsung is likely to add a microSD card slot as well. Also, the Galaxy A3 (2017) will feature a 12-megapixel rear-camera and an 8-megapixel selfie snapper in the front. It will run Android 6.0.1 Marshmallow right out of the box. why do android phone makers think only big sized phone is premium phone? i wanna use small phone, but most of small sized android phone is hard to use. 8gb storage... 8gb or 16gb storage is quite critical. even i can use sd card, it's so inconvenient, and there exists speed difference. the only answer is iphone se so far, but i wanna use android-small-sized-premium-phone!! The answer to your question is simple.. Very few people prefers small premium Android phones.. This was confirmed by the huge sales of Galaxy S7 Edge which is 5.5 inch compred to the small sales of Galaxy S7 at 5.1 inch. You can even check Sony numbers and they will reconfirm my statement. You can not use small phones to watch videos or comfortably play games and thats why people go for phones with large screens. Valid point. I guess I'm in the minority, but I hate gigantic phones. Uncomfortable, if not impossible to use one-handed. Also bulky in the pocket. I wish android had a 4.5-4.7" flagship option. If the storage was more it could be a neat compact phone. Even the RAMs should be higher (at least 3GB) ..
Any phones in 2016/2017 MUST come with 2GB RAM / 16GB storage with MicroSD card.. 4.7" phone will be more pocket friendly (people with outdoor activities def prefer this) and 720p display is perfectly fine at this form factor. Wish Sammy release a nice 4.7" phone soon in US. When will the new Samsung Galaxy C4 be released?? ?